I read recently that sending an interview subject a list of questions and expecting them to send you their answers could be construed as lazy journalism. When you live 800 miles from the interviewer, as Sage Joske does, I claim an excuse, and also claim I was going to write around it, ‘in my own words’ afterwards…anyway. In the end, I haven’t. When you read Sage’s replies you’ll see why. As we prepared for the Musica Surfica event on King Island, Australia in May 2007 I was searching for a couple of extra surfers to join those brave enough to join our finless experiment, Tom Wegener had suggested Heath Joske. A hot young kid with enough smarts to be able to reflect on the experience on camera. Derek Hynd had been a little ambivalent to my suggestion of an extra body or two, not least as he had a budgetary responsibility of sorts and we did have enough. On mentioning the name Joske, however, the email lit up. Joske! Paul Joske is one of the great craftsman shapers of Australian surfing! You can tell a Valla Surfboard from a mile away. Of course they can come. I paraphrase, but this is the thrust of it. Take that as a yes, thinks Mick. I called Heath’s dad, Paul, who’s enthusiasm and intense interest in the whole idea lead to him sending his elder son Sage down, along with an immaculate Joske take on finless, while midway through the event Heath turned up too, direct for Tahiti, adding his own radical flair to the show. For much of the time though, the show belonged to Sage. Over the entire week he demonstrated a catlike ability to stay on a surfboard, and an ability to adapt to anything placed under his feet. Any length board, wood or fibreglass, ancient Hawaiian or modern finless, he stuck to it like glue, spun, got barrelled, adapted, amazed. He could also paddle for months, never tiring, it seemed, with total time in the water of seven or eight hours on some days. I was knackered just watching from the beach. For me though the thing that stood out was his character. Quiet, shy and incredibly unassuming, as I dug deeper I found a thoughtful, kind man who had plenty to say in his own time. He clearly knew his surfing backwards, and his love of it was intense and personal. The feelings of different boards, breadth of experience and respect for what has gone before marked our conversations, as well as a very evident ability to go ballistic if the mood so took him. I like Sage. He is an impressive human being, smart, industrious and with a very clear sense of self. As you read his responses to an arbitrary set of questions I cooked up to get the ball rolling, you will begin to know why the Sage Joske show is no show at all. He is the real deal, if you’ll forgive the expression, and an ornament to the surfing life. Paul and Jenny Joske, you have a lot to answer for. Tell us a little about the history of Valla Surfboards. What took your Mum and Dad up there, how you grew into surfing. Dad’s parents relocated from Melbourne and built a Caravan Park just behind the dunes. This was when dad was 14 so he fell in love with the ocean and surfing from that age. Mum grew up inland at Tamworth and went to university in Armidale, one of her best friends parents lived at Nambucca, so mum would come to the coast for the weekend and she ended up falling in love with the area and the coast. 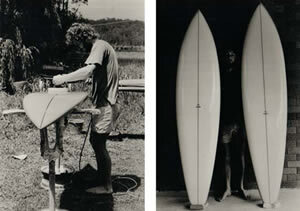 Valla Surfboards came about in 1970 when dad began making surfboards in an old farmhouse out at rural Valla. He couldn’t think of a good name for the boards so he decided to call them ‘Valla’ surfboards till he came up with a better name. 40 years on the name is still Valla. I am not sure if I had a choice to surf or not it was just something we did. Mum and dad didn’t work too much when I was really young so I was always down the beach. Dad was always out surfing so it was more mum who would watch me and encourage me on my coolite. I used to lay the board on the sand, stand on it, and wait for the waves to run up the beach and lift the board up. In some way I think it was my destiny and heritage to be surfer. I used to surf on dad’s old boards and I wanted my own board so dad told me when I could swim 50 metres he’d make me a board. I got my first board when I was 7. A 4’9″ double flyer winged keel. After getting my board I started surfing a heap. At 8 I joined the Nambucca Valley Boardriders club and started competing. I became obsessed with surfing and competing. I was totally obsessed with both till maybe my early 20’s. You went to University and have a degree in Multimedia. Why did you move away from it and decide, after all that work, that surfing was your true love? Half way through my multimedia degree it dawned on me that I probably wouldn’t be working in that field. Just sitting in front of a monitor for hours on end, day after day wasn’t for me. When I was at uni I had a couple of crazy migraines that would take me out and sideline me for a day it was like I was being stabbed repeatedly in the head. Probably a mixture of uni stress and the monitor affecting my eyes but it freaked me out. Also to get a good paying job I’d have to work in the city away from the beach. I decided I wanted to see my degree through but I sort of knew that it wasn’t for me. I guess I am inspired by people that let me view surfing for a little while through the ‘lens’ of their experience. I was really touched watching Woody Brown on ‘surfing for life’ documentary. He seemed like such a warm hearted, giving guy, loving life and still surfing. I want to be like that when I am old. Tom Wegener is responsible for the popularity of the Alaia today. This is inspirational in itself but Tom is also an incredible surfer and a genuine guy. Meeting Derek Hynd at the Musica Surfica event on King Island was interesting. I got to witness his controversy and his free-thinking first hand. I really enjoy surfing and talking/debating with him. Nathan Oldfield has a beautiful insight into surfing and what it means to be a surfer. He makes me feel proud to be a surfer and helps me realise what a special thing it is that we surfers are involved with. I’ve had the pleasure to get to know Andrew Kidman and his family a little over the past couple of years. He has a pure insight into surfing and he’s not influenced by surfing hype. In my eyes he’s a true artist. I find his straight-talk and directness refreshing. Who are your greatest surfing influences? My earliest surf hero was Gary Elkerton but he was Kong to me. I loved the movie Kong’s Island and I have an image ingrained deep into my subconscious of Kong driving through the whitewater as the voiceover guy on the movie says something like “And Kong simply powers through any waves that gets in his way”. I met him once at the stubbies at Burleigh when I was 7 or 8 but I was awestruck and couldn’t say a word. Tom Carroll was my next hero. I loved his power and his committed on rail surfing. Watching Tom on the video’s at Pipeline and Grajagan I was struck by a sense of majesty. A King is his domain. My father has influenced my surfing a lot and my brothers too like the importance of doing a proper bottom turn and laying your board on a rail, he importance of drawing a clean line. These days my surfing is influenced more by looking through the surfing archives at the lines guys could draw on earlier surf equipment. I was really impressed watching Midget Farrelly surfing Bells Beach on the movie Hot Generation. I have an interest riding Old Mals (original boards made before 1967), and I was really impressed watching Midget riding one these style boards. Poised, crisp footwork, quick pivot turns, all arranged seamlessly. Dad really is a pedantic person and his fussiness in making boards really does border on obsessive compulsive. Working with dad is pretty unique. No matter how good a job I do on a board he will spot its flaws – that polish is a bit scratchy, you have a bump in that rail, that colour is a bit uneven, the resin is uneven there. It’s never ending. If he doesn’t say much I know it’s pretty good. When I was learning to glass Dad would look over my work and if he couldn’t spot a flaw he’d go grab his glasses for a closer look. If he still couldn’t spot any flaws he’s go grab this big magnifying glass. Once we got to the magnifying glass I knew the glass job was ok. I think he got excited when he found a bubble sometimes. I guess that pedantic critical nature is what has led to dad’s boards becoming increasingly more accurate and cleaner over the years. But it’s humbling for me to deal with everyday. It can be frustrating because I am bound by time and economic constraints when working. Dad is semi-retired and doesn’t have the same constraints I have. It would be nice not to be confronted and made aware of all the flaws but I guess its good because it speeds up my learning curve to some degree. I think Mum has been very patient with my Dad over the years. The character traits which make him a beautiful board builder would drive most people crazy if they had to live with him. Mum’s also worked hard as a teacher for a long time now while dad’s been so particular with his boards that he’s never really be able to earn much money from the craft. What do you hate about surfing ( if anything) ? Sometimes I feel trapped by my love of surfing. Its in me, in my blood, in me at a heart level. It’s the same building boards too. Building boards then surfing them is such a beautiful and rewarding thing to do. When I’m surfing I think about building boards and when I’m building boards I think about surfing them. But it’s a challenge to pay the bills and get on top of things financially. I’ve got to the end of the month before, done my books, and realised that I’ve actually gone backwards financially. And this is working on the boards diligently, long days and not surfing during the week. I have a mortgage attached to our (Dad and my) shed and sometimes I just get depressed and want to chuck it all in, building the boards that is. But then I think “What would I do?” I am not sure I could do something else and be happy. Its a strange thing but I when I build boards and go surfing it just feels right. I feel like I’m doing what I’m meant to be doing. So if there is one thing I hate about surfing its that I feel a bit trapped by it. But it’s because I love it so much. Do you have a board preference all things being equal or is it a horses for courses thing? I don’t have board preference. I like to ride a board that will suit the waves or suit how I want to surf that day. 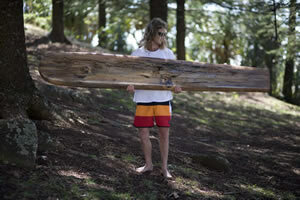 Generally I ride a fish, my Log or an ancient Hawaiian style board. How long have you been shaping? Where are you taking it? All retro and longboards or are you looking at some performance oriented boards that break the mould too? I just love surfing and surfboards. And I want to make something heartfelt. When I began shaping I was really over short boarding. I don’t think there’s anything wrong with short boarding but I had just done it for a long time and was stale with it. So I have mostly experimented shaping fishes, traditional single fin logs and the finless traditional Hawaiian style boards. Right now I’m having a lot of fun making and riding these boards. It’s given me a fresh experience with my surfing and allowed me to draw alternative lines and explore other regions of the wave and experience new feelings on the wave. So naturally I have been making more of these style boards. Occasionally I’ll make my brother a high performance short board. And I have two team riders now, Brett Caller and Jack Lynch, both great surfers. So I am challenged to make different boards for them. 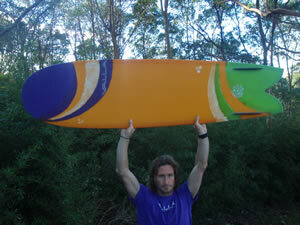 For instance Brett and Jack both wanted modern high performance long boards which I normally wouldn’t make. But the boards have turned out successful and they’ve both won contests on them which is gratifying. Jack’s a beautiful nose rider and he’s talking about a new log which will allow him to spend more time on the nose. Brett who can ride anything, wants to explore some of the 80’s style boards after checking out some of the 80’s templates in our archives. My father has always said that he’s a student of surfing and I feel the same. I really have a lot to learn. I hope to be surfing and crafting surfboards into my old age. You surfed competitively for a while.. how did that go and why did you move away from it? I loved competing and I think that on some level I can be an intense and competitive person. I am trying to funnel those desires in a different direction these days. But growing up it was great. I was fortunate enough to do well as a cadet and a junior. It really is an incredible feeling to put everything on the line and end up winning. It can be an addictive feeling. But the flip side is that it can hurt losing. And even the best guys can’t win all the time. I stopped competing for a few reasons. I was only getting marginal results on the WQS (the best I did was make a couple of quarter finals), I didn’t have the funds to travel and do the full circuit and as a Christian I struggled with certain aspects of the lifestyle. I really enjoyed competing for those years; but I was ready to stop when I did and doing so opened up a whole new world for me. Changing the subject, you are a very reserved, polite person. Where does that come from as it is clearly different to Heath who has a bit of the grommit puppy about him? That’s interesting that you perceive me that way Mick! Maybe I appear reserved because I can be a little shy and standoffish. I feel comfortable within myself and am happy to remain there. Dad’s that way too I guess. Heath, he’s very personable and likeable like Mum. He can be a bad boy on occasions, a very bad boy J . Are you still hitting the water on the alaia and kiko’o boards? If so are you working with developing the shapes or sticking with the purist ancient Hawaiian model? I ride my Alaia and Kiko’o when I get the opportunity. I have been working a lot the past few months and missing a lot of surf so when I do go surfing its often in marginal conditions and I’m riding my Volta fish. The surfs got to be bigger to ride the kiko’o so that also narrows down the opportunities to get on these boards a lot. I’m not currently working on developing these shapes. I am still exploring them and working with my dad to learn how to craft them and get the shape close to the original boards. I think the traditional Hawaiian boards are very special in the inherent design elements and the feeling they give you on a wave. I would like to spend more time riding and making these boards to broaden my understanding of them. That said I have made a hybrid board recently half way between an alaia and a Lis fish. The idea wasn’t to push any performance barriers but rather to explore some of the design elements of the alaia with some of the control structures of the fish. So far the board has been interesting allowing long drifting turns and spins at will. Hopefully I’ll learn a lot more from it over the next few months. It was Mick Sowry that first turned us on to Valla Surfboards and the Joske family a couple years ago with his contribution about Paul Joske’s Paulownia chambered board. Since then we have been hearing and seeing a lot of interesting stuff from the Joske family and Valla Surfboards and it was only fitting that things come full circle as we were looking for someone who knew Sage to get us in touch with him. Mick graciously stepped up and put this piece together for the readers of Phoresia which gives a bit of insight and clarity that comes with a personal connection. So thanks Mick for putting in the time and effort and thank you Sage for the honest insight. Great to see someone recognise the talent and great person that Sage is.He so graceful on any board and just an all round nice guy.